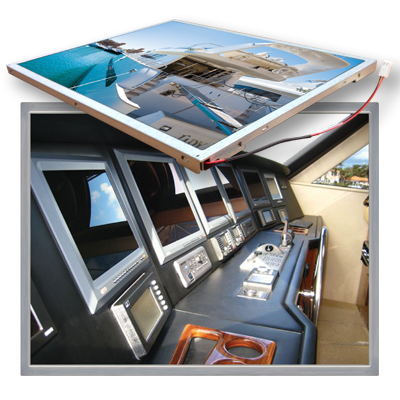 Q-Vio’s Marine LCD Displays are designed with the harsh, wet, challenging marine environments in mind. We begin with long life, wide-clearing temperature displays (when available) and develop our quality display solutions to meet the tough demands of the Marine market. Sunlight Readable LCD Display solutions. Custom LCD displays for virtually any application where outdoor, direct sunlight viewing is required. Upgrades to Your Existing Product. When maintaining the current system display footprint is preferred or required, Q-Vio can enhance brightness, color contrast and uniformity to your existing LCD display. Quick Prototype Turnaround. Our engineering team can provide custom LCD prototypes in a matter of weeks for the initial test and evaluation. A Variety of Cover Glass Options. Ranging from touch screens with Salt Water resistant coatings and performance, AR, AG, smudge resistant coatings along with several ruggedized protective glass coatings including gorilla glass.